Zumba Danced into "World Happiness Day" With Mr Vegas "My Jam" Feat Pitbull Global fitness leader Zumba, known for making people happy all over the world, has partnered up with Pitbull’s record label, Mr. 305 Inc., to celebrate International Day of Happiness on March 20th. The International Day of Happiness was established in 2012 by the U.N. General Assembly and hopes to recognize the "relevance of happiness and well-being as universal goals and aspirations in the lives of human beings around the world" and in public policy objectives. To celebrate, Zumba is launching a video campaign set to the contagious remixed track of "My Jam," performed by internationally famed dancehall artist Mr. Vegas featuring Pitbull. 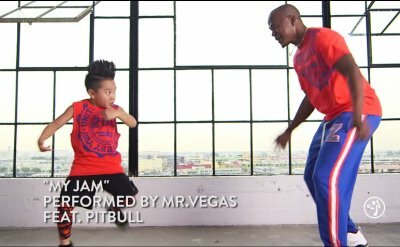 The music video for “My Jam” includes Mr. Vegas and 8-year-old YouTube dancing sensation Aidan Xiong jamming to the happiness anthem. "Pitbull contacted me and said, ‘I want you to hear this song because it makes me even happier than ever,’" recalled Zumba CEO Alberto Perlman. "As soon as I heard 'My Jam,' I knew it was the perfect song for International Day of Happiness—and today we share it in order to inspire others."